There are many ways to prepare polenta and because of all the dos and don’ts that come with cooking it some folks are far too trepidatious to try. I am here to tell you if you haven’t made polenta yet, it is time. It really is simple and you will be rewarded with a bowl of luscious polenta and never be intimated again. If you are interested in a lighter rustic polenta follow this cooking method. Otherwise, here is a recipe for an unforgettably creamy polenta. Be warned…it has lots of butter, milk and Parmesan cheese. And giving credit where it is due, this polenta recipe comes from the barefoot contessa, believe me, I could never dream up a recipe for such a rich delicious polenta like this. Preheat oven to 425°F. Place butternut squash in a bowl with 2 tablespoons olive oil, salt and pepper and coat well. Place on a baking sheet in one layer and bake for 30 minutes or until your squash is soft and the edges are a bit caramelized. Heat the butter and olive oil in a large saucepan. Add the garlic, red pepper flakes, rosemary, salt, and pepper and sauté for 1 minute. Add the chicken stock, half-and-half, and milk and bring to a boil. Remove from the heat and slowly sprinkle the cornmeal into the hot milk while stirring constantly with a whisk. Return the pot to a low heat and cook, stirring constantly, for a few minutes, until thickened and bubbly. Off the heat, stir in the Parmesan. 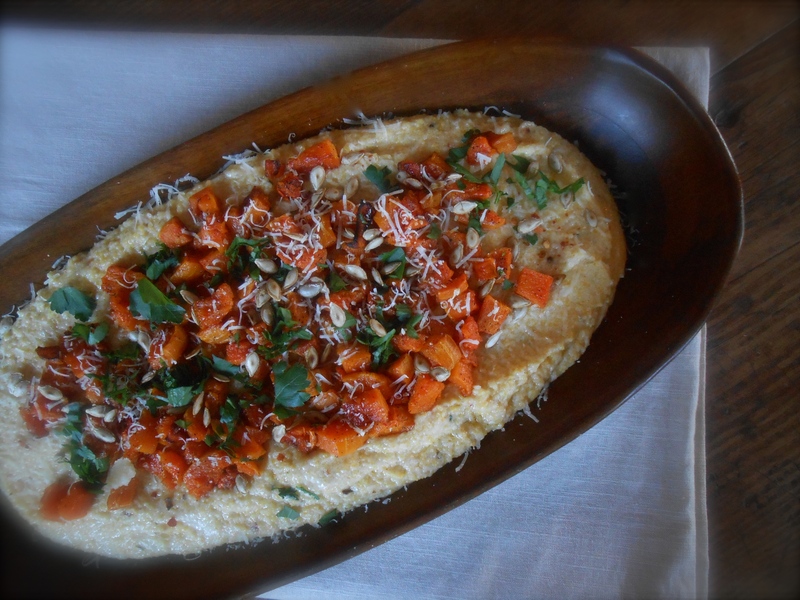 Pour the polenta onto a serving dish and top with butternut squash, parsley and freshly grated Parmesan. What a great topping for polenta. Butternut sqash is one of my favorite vegetables. I just wish it was easier to peel. This looks so delicious. I really like polenta and I love the idea of adding butternut squash to it. Beautiful photo. Thank you Amanda. Sometimes I become so weary of the photographs I post. Seems like they all look the same! But who am I kidding? I’m not a photographer and I don’t use a very good camera. :) It’s always nice to hear from you….thank you. You never cease to amaze me. I never would have dreamed of putting butternut squash over polenta.. Brilliant. While we’ve only been friends for a short time, it feels like forever…and you know about Michael and his fussiness.. This is definitely not a dish that I could get away with when he’s around, but luckily, they’re all going to the Sabre’s game, and I have the house to myself tomorrow night! Guess what I’ll be making for my dinner… and then for my lunches for the rest of the week!! This is a fabulous recipe, Seana.. I cannot wait to give it a try! I hope you make it for yourself Pru! It’s so good and I had it for lunch the next day and it was perfect as leftovers. Nice to have a little time to yourself every now and then, huh! :) Have a good week. I think it’s about time I tried polenta!! Yes, Elaine…you must try polenta. You can do so much with it. Anything you can imagine would be wonderful to put on top. I love roasted vegetables on polenta, but have never done butternut squash! Hi there. Nice to see you here today. :) I have never put roasted vegetables with polenta before. Really enjoyed the butternut squash, especially with the creamy version of polenta. It’s rich and comforting. Me too. I love polenta. It’s so easy to prepare and the toppings are endless. We even had polenta as a breakfast cereal the other morning. I added maple syrup, butter and a little milk and it was wonderful. Have you had it as a breakfast cereal before? Seana, What a comforting, fresh and fun dish. Your polenta looks perfectly cooked. And, you know how I feel about squash. :-) Beautiful photo of your recipe! That is a damn good looking polenta. Indeed, it was really good. Do you make polenta? I’m curious. Yep. Love the stuff. I don’t use butter but make a milk stock with heaps of herbs, onion, garlic and parmesan rind. Tasty! It will be for sure. You can’t go wrong, unless you use beef stock instead of chicken or vegetable stock. I tried that once and it was the most horrific brown colored polenta! I threw it in the garbage and started over! :) Don’t ever use beef stock with polenta…. ha! I love polenta, it one go my preferred comfort food…but I’ve never tried with squash… thank you for sharing! Polenta is such a comfort food. I really enjoyed it with all this delicious butter and cream. I don’t usually prepare it this way and it was a nice change, especially with butternut squash. Give it a try if you get a chance. Very mild, comforting and soulful. I generally just cook polenta in stock, must try this decadent version, though I fear it may be addictive and detrimental to my “wasteline”! Hi Sandra. I do the same, basically cooked in stock. This was so delicious, you are right…detrimental to the waistline for sure, but, hey…why not every now and then…not an everyday polenta, but for guests…yes! This looks delicious! Polenta is on my to try list! Oh good! Hope you try this and several different polenta preparation methods. Just the other day we had polenta for breakfast with maple syrup, butter and a little milk. It was wonderful! There are so many things you can do with it and so many toppings which are wonderful. This is the first time I used milk and half/half in the cooking process. It really was wonderfully creamy. I love the colors here! This sounds absolutely delicious… I’ve never made polenta before, but I’ll definitely make this recipe my first try! Thank you Julia. I agree about the colors, something about the rich orange color of butternut squash. Hope you make the polenta, it is much easier than you imagine. This recipes is so creamy and delicious. Polenta is on my list of food to conquer, you made it sound so simple! And really…you can’t go wrong with the barefoot contessa. You will not believe how simple it is once you make it! You will conquer! I really like the barefoot contessa’s style. So easy to watch and I have success with every recipe of her’s I have tried out. She wonderful! Hope you make the polenta, you’ll love it. I’m not familiar with Polenta but I will try this one. I love polenta! Runs in the family, so did my granny and does my mum and I really liked the idea of combining it with some veggies! Thanks for the tip, great blog! and I can practice my forgotten French which I hardly use this days… I’ve prepared a polenta for the blog some weeks ago, but didn’t like the pics outcome, so I never published it, but it was delicious, polenta is a simple ingredient with the ability to improve any dish! bee-you-tee-ful :-D And so virtuously healthy. Love it. Hi Liz! :) thank you…. What a gorgeous dish!!! I love the idea of lots of butter and cheese right around now! Me too Azita! What is it about the end of winter that makes you feel like you need to just dive in with butter and cheese? Maybe we know deep down the winds of change of are coming and we’ll start eating lighter, fresher foods. Just tonight I found myself with the butter keeper adding more and more to a risotto and thought “when am I going to stop with the butter?” I’m looking forward to spring, for sure. :) wish it were possible, you are welcome for dinner! Oh my, that reminds me of Roman gnocchi, which is made with semolina and baked with so. much. creamy buttery goodness. Saving this for winter! Wow. I can not say I know what Roman gnocchi is…but I LOVE the sound of it. It must be difficult to see these types of recipes in the heat! Today I took a salad for lunch and cursed myself that I didn’t bring something hot and comforting! Needless to say, looking forward to some warm weather over here. Summer is leaving us behind, soon I’ll be living vicariously through your summer photos! This looks amazing! Polenta is such a wonderful comfort food. I love the idea of topping it with butternut squash. Hi Mary Frances! Polenta is one of my favorite dishes to make. I love when it is done cooking and you spread it out on a wooden platter to serve. It’s marvelous! It was very good with butternut squash, and it was so simple to prepare too. This is my kind of dish. So clever combining these ingredients together as a dish. Oh wow, this looks marvelous, I so love creamy polenta and especially served with vegetables or ragu. Ragu…yes, one of my favorites with polenta. I haven’t made anything with polenta yet, but you are inspiring me! :) This looks delicious! Oh I hope you do try it Nancy! It really is delicious and surprisingly simple to prepare. :) Thank you for your comment today. Nice to hear from you. Yum! I haven’t had squash in quite some time. That dish sounds easy and tasty. YUM! Anything containing ‘lots of butter, milk and Parmesan cheese’ is a winner in my book. I’ll be honest, I’ve never had much luck with polenta, but this recipe could definitely sway me! Love the sound of the ingredients, especially the garlic, red pepper and rosemary. I think my attempts have always been a bit bland, but this sounds positively flavor-packed. This was the first time I tried making polenta with all these lovely creamy ingredients. It was wonderful, and I have yet to make an Ina Garten recipe and fail. She’s fabulous. Maybe give it “one more try”! :) It’s delicious Saskia. Wow! This looks and sounds amazing! I have never had polenta before, but it sounds great. Thank you Lori. Nice to see you visiting today. And thank you for following my blog too. Polenta really is great. Hope you get a chance to try some, it’s a lovely alternative to pasta. :) Yeah, well now I have a sweet tooth after seeing your almond flavored cookie dough ball with dark chocolate chips! You are currently reading roasted butternut squash on polenta at COTTAGE GROVE HOUSE.